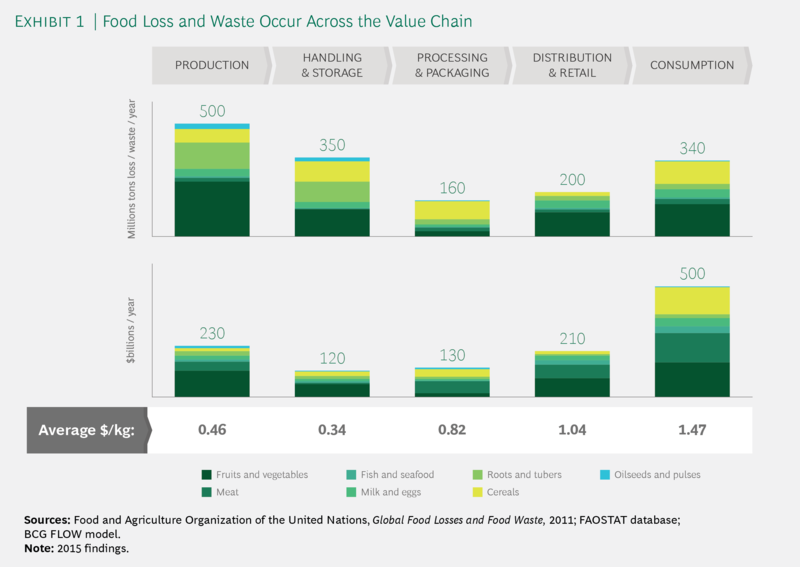 Food loss or waste occurs at all steps in the value chain—but it is most pronounced at the beginning (production) and at the end (consumption). (See Exhibit 1.) In developing countries, the problem is largely a function of the production and transportation of food from farms, while in developed countries it is most prevalent in the consumption phase, among both retailers and consumers. 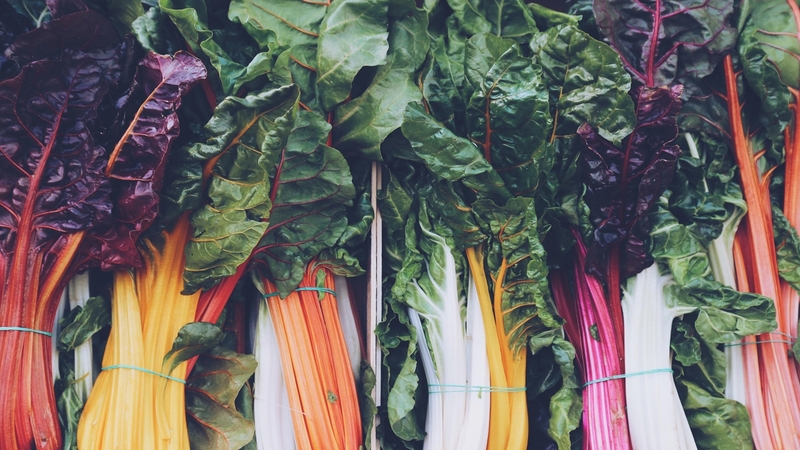 For a clearer view of the forces at work, we dug into information from major food waste global initiatives. That research helped us identify five drivers of the problem: lack of awareness of the issue and of possible solutions, inadequate supply chain infrastructure, supply chain efficiency efforts that do not focus sufficiently on food loss and waste, weak collaboration across the value chain, and insufficient regulations. 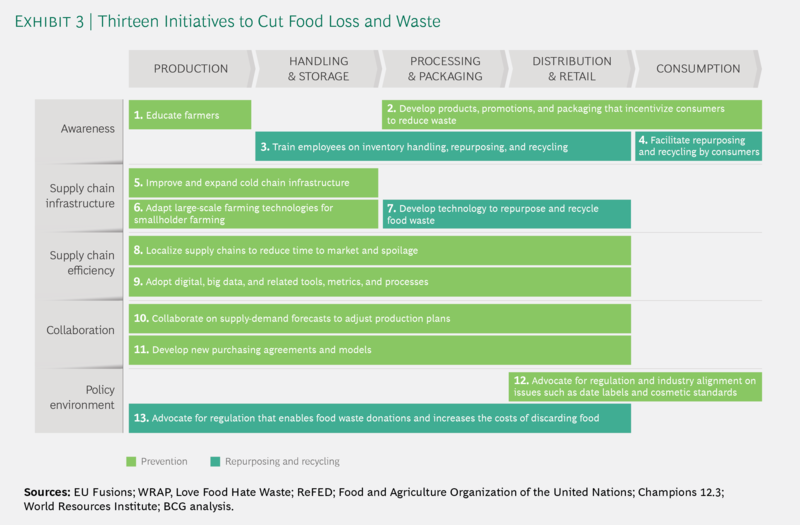 For each driver, we estimated the annual reduction in loss and waste that would be possible if all stakeholders—such as governments, NGOs, farmers, and companies—took action. (See Exhibit 2.) The estimates are based on currently available technologies and processes and reflect realistic progress in each driver, not complete elimination of the issue. 1. Food and Agriculture Organization of the United Nations, Global Food Losses and Food Waste, 2011; FAOSTAT database; BCG FLOW model. 2015 findings, in 2015 dollars. 2. Identification of the five drivers and the 13 initiatives was based on a review of major reputable sources on the topic including EU Fusions, WRAP, ReFED, Food and Agriculture Organization of the United Nations, Champions 12.3, and WRIB.